Bank Barn is the barn that's built into the side of a hill (bank), making it possible to provide the accessibility to both first and second floors at ground level or via a built up ramp. The first floor of a Bank Barn is built with either cement blocks filled with concrete or poured concrete walls, in order to hold the pushing force of the ground on three in-ground walls. In order for these walls not to collapse, it is important to properly design the foundation and build thick enough walls. 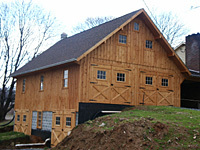 Construction of a Bank Barn is mostly done in those areas where the level site is simply not an option. Prepare to spend between 20%-30% more on the bank barn compared to a regular 2 story barn, or up to 50% more compared to 1½ story barn. Since the second floor of a Bank Barn can be accessed from the ground level, a lot of times people would use second floor to store heavy equipment, tractors or park vehicles. Even if you are not planning to use the second floor to park cars or store anything heavy, it's still a good idea to design and to build the second floor strong enough to hold the weight of cars and trucks. There are two ways you can build the second floor. You can build strong enough wooden floor or pour concrete slab. First of all, you will need to install metal I-Beams and metal supporting posts underneath these I-Beams to support the second floor. Depending on the span of your floor joists, you should either use #1 2x12 Yellow Pine joists with 12" o.c. spacing (for spans up to 12') or LVL beams for greater spans. On top of the floor joists place 2x8 T&G Yellow Pine boards in staggered pattern and you'll have a very strong floor. NOTE: Tips and Information provided here is not a professional advise and should not be considered as a professional advise. We hold no responsibility for any information listed on our website. Always consult an engineer or other professional before making the final decision.